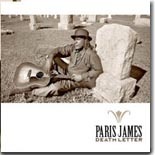 From the desert southwest in Phoenix comes a stunning traditional blues disc, Death Letter, from guitarist/singer Paris James. It's this month's Pick Hit. Native Jamaican Roy Young went to Memphis to record his debut CD by the same name, and the classic soul disc is our Surprise hit for the month. The late, great harmonica legend Snooky Pryor is honored in this month's Flashback section, as we take a look back at a collection of his early recordings. This month's What's New section is short but sweet, with new releases from Moreland, Arbuckle and Floyd, Barbara Blue, Aynsley Lister, Bernard Allison, Frankie Lee, D.C. Bellamy, Lil' Dave Thompson, Paul Mark & the Van Dorens and Ric E Bluez, as well as a collection of instrumentals from Canned Heat and a 'best of' collection from Little Feat.